This blog is for whom is implementing the “eDocument: Electronic Invoicing for Italy” solution having only one SCPI (HCI) tenant and needs to have both production and test environment running in parallel. This is a nice-to-have option but after reading the following prerequisites you might understand this is not 100% applicable to your scenario. I’m just sharing my experience hoping it could help. You have already deployed and tested the original package “eDocument: Electronic Invoicing for Italy” (version 1.0.2). The reason is you cannot deploy two iFlows with the same endpoint (the sender side endpoint, the one called by the external application). That’s why we need to differentiate it when you copy a standard package in order to have it deployable. If you registered the same endpoint for test and production endpoint, you might find interesting this blog. Go to Discover, look for the “eDocument: Electronic Invoicing for Italy” package, copy it. Click on “Create copy”. Then it will appear in the Design section. Before deploying all, I’ve done the following two steps. Configure all the endpoints: not only those called by SdI but also those called by your SAP backend (remember you cannot deploy two equal endpoints). Here below some examples. Repeat it for the remaining endpoints. 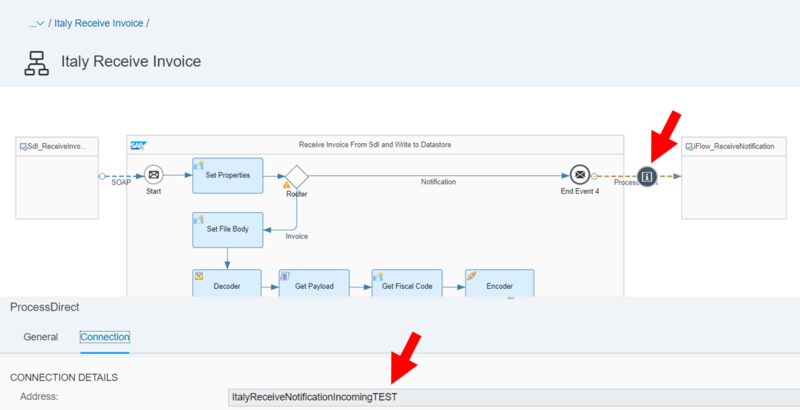 Deploy all but the Italy Sign Service Aruba iFlow (you can use the original one, but if you need to customize this part, do it in accordance with what has been shown above). The iFlows are duplicated but notice the ID: the suffix TEST makes them different. Adjust your Consumer Proxy settings (tcode SOAMANAGER) to call the new TEST endpoints. 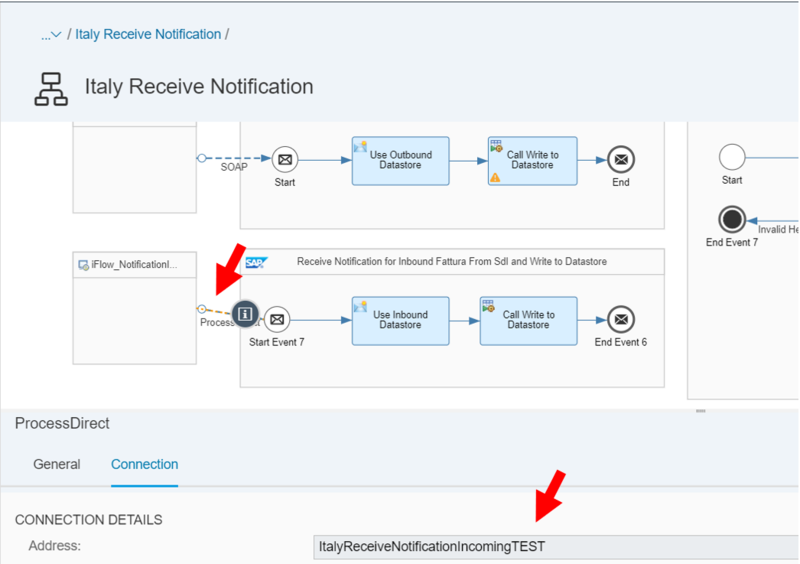 In this case your test SAP backend will call the iFlow with TEST mode configured, whereas the iFlow with PROD mode configured will be called only by your production SAP backend. Send an invoice from tcode EDOC_COCKPIT, check the message in the SCPI Message monitoring. Notice, the TEST iFlow has been called. Notifications are stored in the new TEST datastore. Notice the datastore are all duplicated but the copy reports the TEST suffix. Run tcode EDOC_INBOUND_MSG with the message type IT_NOTIF_OUT_PULL.